Swedish: A Comprehensive Grammar is an award-winning complete reference guide to modern Swedish grammar. 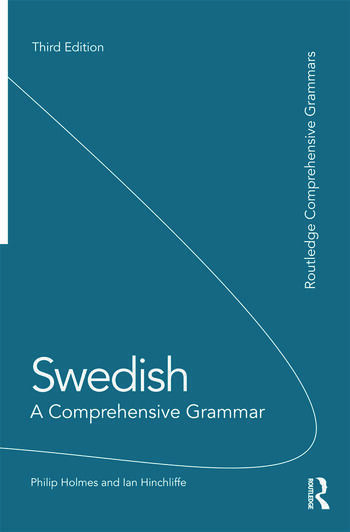 Systematic and accessible, the volume is organised to promote a thorough understanding of Swedish grammar, presenting the complexities of Swedish in a concise and readable form. Explanations are full, clear and free of jargon, and an extensive index, numbered paragraphs, cross-references and summary charts provide readers with easy access to the information they require. Now in its third edition, the text has been comprehensively updated to conform to new standards set in the description of language and to reflect the recommendations of the Language Council of Sweden. It offers an improved layout, completely revised index and more user-friendly paragraph structure. Continuing the tradition of previous editions, the emphasis remains fixed on Swedish in everyday communication, drawing on modern corpus material, the internet and the media to provide high frequency words and expressions. Examples have been modernised throughout and new content takes account of recent trends resulting from the increasing democratisation of written Swedish. chapters on word formation, orthography and punctuation. Swedish: A Comprehensive Grammar is the most thorough and detailed Swedish grammar available in English and is an essential reference source for the learner and user of Swedish, irrespective of level. It is ideal for use in schools, colleges, universities and adult classes of all types. Philip Holmes is Reader Emeritus in Scandinavian Studies at the University of Hull, UK, and is now a freelance translator. Ian Hinchliffe, a former lecturer in Swedish, is a freelance translator, copywriter and founder member of the Swedish Association of Professional Translators.